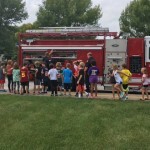 Mrs. Megan Johnston’s third grade class was surprised on Thursday, September 22, by the Waukee Fire Department and their fire engine! As a class, the third graders had been discussing local heroes that we could find in our community. After brainstorming a list of local heroes, as a class they chose one type of hero to write thank you letters to. 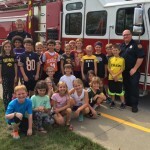 The class chose the Waukee Fire Department. Each student wrote a thank you letter to them telling them why they appreciate them. They have also been reading “I Survived the Great Chicago Fire of 1871″ during teacher read, so the lesson tied into what they were hearing in that book. The students loved the surprise!